This image illustrates the beginning stages of an influenza infection and shows what happens after the influenza viruses enter the human body. immunity to influenza A virus, which causes annual seasonal epidemics and occasional pandemics. 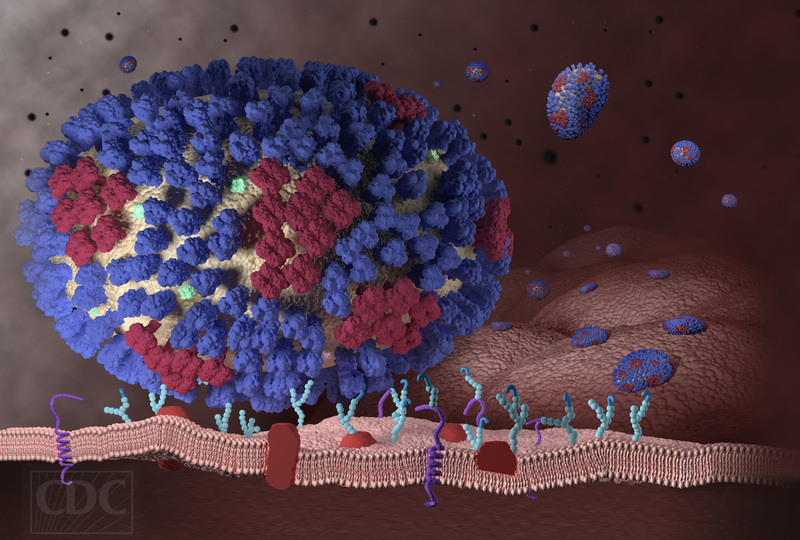 The research, outlined in a paper published online today in the journal Nature Microbiology, could have broad implications on the immunological understanding of human diseases caused by RNA viruses including influenza, Ebola, West Nile, and Zika viruses. “This opens up a new way to understand how humans respond to viral infections and develop new methods to control viral infections,” said Shou-Wei Ding, a professor of plant pathology and microbiology at UC Riverside, who is the co-corresponding author of the paper. The findings build on more than 20 years of research by Ding on antiviral RNA interference (RNAi), which involves an organism producing small interfering RNAs (siRNAs) to clear a virus. His initial research showed that RNAi is a common antiviral defense in plants, insects and nematodes and that viral infections in these organisms require active suppression of RNAi by specific viral proteins. That work led him to study RNAi as an antiviral defense in mammals. In a 2013 paper in the journal Science he outlined findings that show mice use RNAi to destroy viruses. But, it remained an open debate as to whether the same was true in humans. That open debate led Ding back to a key 2004 paper in which he described a new activity of a protein (non-structural protein 1, or NS1) in the influenza virus that can block the antiviral function of RNAi in fruit flies, a common model system used by scientists. In the current Nature Microbiology paper, the researchers demonstrated that human cells produce abundant siRNAs to target the influenza A virus when the viral NS1 is not active. They showed that the creation of viral siRNAs in infected human cells is mediated by an enzyme known as Dicer and is potently suppressed by both the NS1 protein of influenza A virus and a protein (virion protein 35, or VP35) found in Ebola and Marburg viruses. The researchers in the lab of the co-corresponding author, Kate L. Jeffrey, an investigator in the Massachusetts General Hospital gastrointestinal unit and an assistant professor of medicine at Harvard Medical School, further demonstrated that the infections of mature mammal cells by influenza A virus and other RNA viruses are inhibited naturally by RNAi, using mice cells specifically defective in RNAi. “Our studies show that the antiviral function of RNAi is conserved in mammals against distinct RNA viruses, suggesting an immediate need to assess the role of antiviral RNAi in human infectious diseases caused by RNA viruses, including Ebola, West Nile, and Zika viruses,” Jeffrey said.